The book, with the same title has now been published and is available from Amazon and with the grateful assistance of Mr David Hamilton of the Partick Press. This 20 years of research has blew the lid off of all Scotland’s previous known golf courses, with hundreds of new and never seen before entries. Buy the book now on Amazon. Colin Montgomerie O.B.E.,turned Pro in 1987. I was working as a volunteer for the P.G.A. at his first pro appearance and have followed him ever since. We are thrilled to have his encouraging words on our site.He was born in 1963 and is the 4th all time winner on the european tour with 31 wins. He has won twice on the Asian tour, 3 times on the champions tour, and 8 times on the European Seniors tour, along with 8 other titles. He won the European tour order of merit a record 8 times and has an incredible Ryder cup record, having never lost a singles match. He captained the side in 2010 at Celtic Manor. His two major victories came in the seniors tour and he was runner up in the Senior P.G.A.Championship this year. Colin has been an ambassador for Scottish golf for many years, and as such, it is fitting that he should contribute the opening comments on this site. Thanks Colin. Many Web Sites have been produced on golf and its history and every now and then one appears which sets new standards and stands out above the rest, I believe this site to be one of those. Scotland has always been the home of golf and has been blessed from the outset on its unique courses, large championships circuits to the smallest village nine hollers. The information contained herein compliments even further the vast expansion of our national game during the late 19th century, and Harry, aided by the numerous unaltered newspaper articles, convey's quite brilliantly to the reader an understanding of how the game of golf was perceived and adopted so enthusiastically by the masses both young and old, rich or poor. Another surprising and interesting aspect of this research is the number of early unknown clubs and courses which have been uncovered and brought to our attention.This site will appeal to anyone who is interested in golf, to the most avid historian and to the thousands of club golfers, male or female, who just simply love the game. Most of the golf courses detailed on this site are being brought to the public for the first time since their formation, and the title could not be more apt ( Forgotten Greens ), for a reference document I find it most refreshing and exciting.I heartily congratulate Harry on this fine effort. It is both humbling and an honour to offer a few words in praise of this web site. The dedication and effort which must be exercised in such a valuable contribution to golf history can often go unnoticed or unappreciated. Therefore, I would like to heartily commend Harry for this extraordinarily fine effort. It goes without saying that this site will prove to be an invaluable reference for future researchers of our great sport. Golf courses have sprung up, blossomed, and then died away over the past century, and more. None least in Scotland, the recognised ‘hame o’ gowf !’ The reasons for this are variable and stem from the effects of war ; disputes over ground leases ; alternative development of the land ; subsidence due to underground mining and possibly erosion ; or simply a club transferring its activities to a better site or location. That was in the past. Today and in the future, the sport of golf might find itself threatened by another issue – that of equipment technology advances and the escalation of its effects of continued distance attainment thereof? Indeed, it can be easily argued that technology advances in the past were directly responsible for the demise of dozens, if not hundreds, of our early pioneering golf courses. Therefore, this web site is not merely a reference guide of the forgotten and now defunct golf courses of the past, but an insight and possible warning of times to come. To blatantly ignore the lessons of history in any realm of life is foolhardy in the extreme! Of course, there will remain a few courses, as yet, still undiscovered. Especially those from centuries back in time which may, in all probability, remain forgotten forever? Those sporting mysteries of –man, stick and ball? The Late Alfie Ward who passed away in February 2018. Alfie Ward was a well known golf historian from Biggar in Lanarkshire, Scotland. 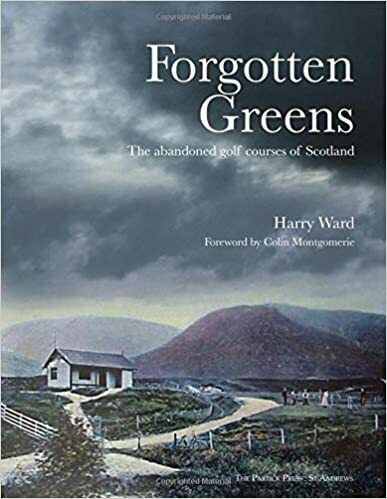 Past publications included the History of Biggar Golf Club and more recently, Fairways What Fairways, a must read which covers the story of the construction of Arbory Brae golf links. A section of this site has been dedicated to Arbory Brae. Alfie also wrote on a regular basis, his most recent, a run of seven golf history articles in the National newspaper. A brother, but most of all my best pal.